The queen of comfort in this one-of-a-kind vintage multi-texture weave! 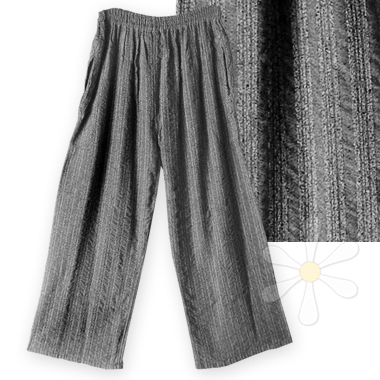 The cozy-as-pajamas fit is just one of the many delights of these yummy-soft pants, cut wide and straight from top to bottom -- roomy and flattering on a broad range of figures. Deep side pockets trimmed in traditional quilted trapunto topstitching and a wide elastic waist stitched in three individual rows that won't pinch make these both stylish and comfortable.